Arcata City Councilmember Sofia Pereira (left) and Mayor Susan Ornelas listen as members of the public weigh in at a special study session called to discuss the fate of the statue of President William McKinley and a plaque commemorating the Jacoby Storehouse on Dec. 4. 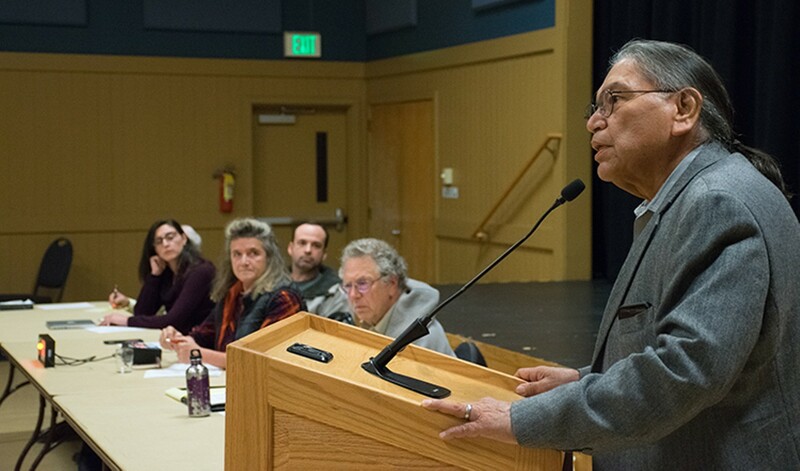 One by one, dozens of speakers addressed the large crowd gathered in Arcata's D Street Community Center on Dec. 4, passionately describing divergent views of two vestiges of the city's past placed on the Arcata Plaza nearly 60 years apart. One, the statue of President William McKinley, has stood prominently in the city's center for more than 100 years, while the other — a large boulder with a plaque marking the Jacoby Building's status as a California Registered Historic Landmark — might be easily overlooked at its place in the corner of the plaza. Dedicated back in 1963, the plaque's inscription describes a bit about the building's history: How it was built in 1857 for Augustus Jacoby and served as supply point for the Klamath-Trinity mining camp trade for many years before later being acquired by A. Brizard in 1880. But mixed between those innocuous details is the affronting phrase, "it served periodically as a refuge in time of Indian troubles," belying the systematic massacres and atrocities committed by local settlers and soldiers against the area's Native peoples. Now both are at the center of a local debate mirrored in cities across the nation: How to confront painful chapters of the past embodied by landmarks still standing in the present. For some, the monuments are simply part of Arcata's backstory, for better or worse, which cannot be erased by simply taking them down. "It's a nice statue and it's our history," one woman said. But for others, they are overt symbols of racism and oppression whose time in the city's center has long needed to come to an end. 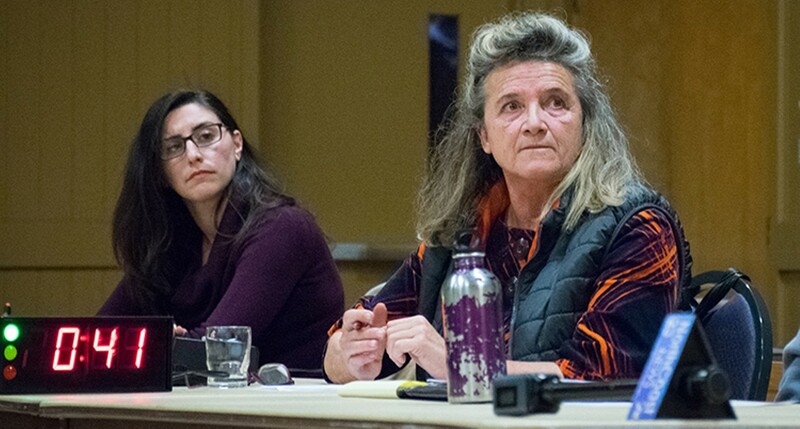 "The city of Arcata needs to decide what value system it will perpetuate into the future," Chris Peters told the city council at the study session, echoing the overwhelming sentiment of most speakers. If not for a series of fateful events, the McKinley statue — and the controversy — might never have existed in the first place. It's creator, Haig Patigian, managed to flee the Ottoman Empire with his parents in the turbulent years preceding the Armenian Genocide. After making his way to San Francisco near the turn of the century, the up-and-coming artist soon crossed paths with an 81-year-old Arcata rancher whose admiration for McKinley was reportedly cemented after meeting the nation's 25th president just a few months before he was shot while standing in a reception line at Buffalo's Pan-American Exposition. While his presidency would be overshadowed in the annals of history by his successor Theodore Roosevelt, McKinley's assassination just six months into his second term sparked a period of national mourning that stretched to the rural reaches of the North Coast. George Zehnder commissioned Patigian to create McKinley's image as a gift to Arcata in 1905. Similarly, the people of nearby Minorsville renamed their town McKinleyville to honor the slain president. A few years after McKinley's death, Arcata's Board of Trustees — the precursor to today's city council — gathered for a special meeting in September of 1905 to unanimously grant a request by Zehndner, referred to as "a public spirited friend" of the city, to commemorate the late president with a statue in the plaza. "Resolved, that this authority is given upon the condition that said statue when completed shall be dedicated to the people and shall be the public property of the city of Arcata," the hand-scrawled minutes read. Approval came the next year to take down a bandstand and flagpole from the center of the square in preparation for the arrival of the nearly 9-foot statue that was to be placed on a 26-ton pedestal made from local granite. Then, eight days later, on April 18, the great San Francisco earthquake of 1906 struck with the ensuing fire burning down the foundry where the statue was cast. But somehow the bronze work survived, reportedly rescued by workers who had been watching its progress. A month later, it arrived in Eureka by steamboat before being brought to its current location. While the statue's 1906 dedication on the Fourth of July was met with much fanfare more than a century ago, McKinley's place in the plaza has been a matter of controversy in recent decades. The last president to have served in the Civil War, McKinley was known as a proponent of industry and a purveyor of American interventionism on the world stage, leading the nation into the Spanish-American War. His imperialist tendencies and ruthless quelling of an uprising in the Philippines shortly after the United States acquired the former Spanish colony, along with Guam and Puerto Rico, following the war are among the reasons many at Monday's meeting — as others have in the past — said his statue needs to come down or, at least, be moved. In 2015, the council held off on accepting a proposal by the Humboldt State University Armenian Student Association to place a plaque on the statue recognizing Patigian's heritage and the genocide in his home country, as well as the massacres of Wiyot people — on whose ancestral land the plaza sits — and McKinley's acts of imperialism. 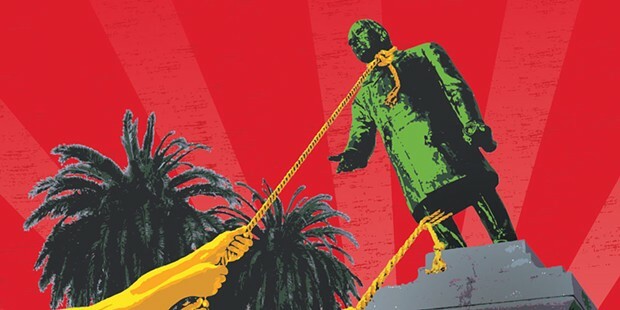 A decade earlier, local resident Michael Schleyer led a charge to bring the statue down, suggesting that the city could sell the bronze casting on eBay, but a divided city council voted against taking any action on his petition, with then Councilman Mark Wheetley saying it was time to grant McKinley "amnesty." Now the future of the statue and the plaque are set to again come before the Arcata City Council on Feb. 21. And if Monday's meeting was any indication, there are no easy answers ahead. The council will face a number of questions: Take it down? Keep McKinley but add an interpretive display? Move the statue, but if so, where? Some have suggested sending the statue north to McKinleyville, which had expressed some interest in taking it in 2005, while others have pointed to McKinley's Presidential Library in Canton, Ohio. The assistant curator there, noting "this has come up quite a few times, hasn't it," said in an email to the Journal this week the museum would be open to the possibility, "however we are not in a financial position to contribute any funds towards its move to Ohio." According to a 2005 estimate, the cost of removal won't come cheap — $75,000, including an environmental impact report. Complicating the matter is the fact that the McKinley statue is one of several "principal features of the Plaza" that the city's General Plan states "shall be preserved." For the plaque, things are less complicated: Leave the inscription but add one that shares the Native American (and more historically accurate) point of view or replace the plaque with one that just talks about the building's history? Councilman Michael Winkler said he believes the solution is obvious — the plaque needs to be taken off but perhaps moved to the Phillips Museum to be preserved. "I think the plaque is clearly totally racist and the words 'Indian troubles' is really just code for genocide and just a cover-up for everything that happened," he said. Arcata Councilman Paul Pitino echoed similar sentiments in an interview earlier this week, saying it's time for the council to act — one way or another. "I feel like when something keeps coming back, you've got to make a decision or it's never going to go away," he said. In true Arcata spirit, some of the ideas presented at the meeting ranged from whimsical to peculiar. One woman suggested creating a clearing so the town could gather like the "Whos down in Whoville" while a man wearing a Santa hat and beard, who introduced himself as McKinley's assassin Leon Czolgosz, floated putting up a plaque noting the president was the only U.S. commander in chief ever killed by an anarchist. But most in the crowd expressed frustration that the issue keeps coming up over and over again with no resolution. How many times must Native people and people of color share the traumatic legacy of these symbols before being heard, several asked. "If not now, when?" one woman asked urging the council to take a stand. "Is this city going to do the right thing? If not, when? The time is now." Kimberly Wear is the assistant editor and a staff writer at the Journal. Reach her at 442-1400, extension 323, or kim@northcoastjournal.com. Follow her on Twitter @kimberly_wear.